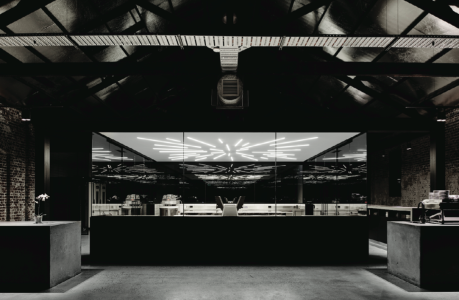 After developing a number of concepts in collaboration with Studio Esteta, the ceiling of Lune Lab is formed of LED strips derived from the branding of the business. Each strip was made up on-site to the exact measurements marked on the ceiling. The main baking oven required a massive 63A, three-phase supply – the total capacity of the whole warehouse. BREC facilitated an upgrade of the existing mains to ensure power supply would be available to each appliance when it was required. A clear vision is always important. One of the largest parts of our work is also one of the most hidden. Calculating the power requirements and ‘maximum demand’ of large commercial kitchens and installing the right cables early in the project is essential. It’s surprising how much power can be allocated to kitchen appliances. Ovens, hotplates, dishwashers, toasters and coffee machines all demand a lot of power and can add up very quickly and leave you with little room to expand. Building is a team sport. The client, architect, builder and sub-trades all need to work together to deliver the best possible product. As with most construction projects, there are changes from what is drawn on paper to what is presented on site. We often have to think on our feet and make quick decisions to get around obstacles. A key part to the success of our business and our projects is problem-solving. Providing clients with clear and precise solutions is valuable. As a general rule of thumb, electrical should be about seven percent of the total build cost. Although this can obviously vary depending on final finishes. These days, the balance between materials and labour is an equal cost on most construction projects. We see new products almost every day and I spend a lot of time researching the latest lighting trends and new technologies within the industry. Lighting automation has become very popular both at home and in the workplace. Setting the mood with the push of a button on a touch panel or mobile phone is fast becoming the norm. LED lighting has been around for some time now, but it’s only recently that I feel it has made huge steps forward. Colour temperature, lumen output and dimming control are now on par with halogen and just as effective in replicating the perfect light. I see sustainability as a part of good business. I also see operating a sustainable business as being a responsibility of all companies. We advise on an array of energy-saving options with all of our clients, but that’s only the beginning for us. We recycle everything we use on-site, from copper cable to cardboard packaging, all the way through to globes and batteries. We have a detailed sustainability statement to make sure we meet our obligations as a business. It’s great to see lighting de- signers (especially local ones) becoming the new must-have names on a construction project. Christopher Boots, Ross Gardam, Dowel Jones, Porcelain Bear and Anchor Ceramics –to name just a few of our current favourites – are already in high demand. Lead image, Lune Lab at the Lune Croissanterie. Photo by Tom Blachford. Subscribe to MEZZANINE today through newsstands and digitally through Zinio.